University of Iowa volcanologist Ingrid Ukstins spent two weeks collecting samples from Yasur, a continuously erupting volcano on Tanna, an island in the remote South Pacific archipelago of Vanuatu, to study its chemical composition and determine how the gasses it produces may be affecting people who live nearby. Video by Ben Simons, University of Auckland (N.Z.). For two weeks last fall, Ingrid Ukstins lived life on the wild and dangerous side. The University of Iowa volcanologist spent her days collecting samples from a volcano on Tanna, an island in the remote South Pacific archipelago of Vanuatu. The volcano, called Yasur, spews out flaming masses or “bombs”—some the size of a small car. So, Ukstins trained her eyes on Yasur’s craters, about a quarter mile above sea level, to wait for molten rocks to be ejected—and “try not to get hit on the head by any,” she adds. In the field, Ukstins watched for eruptions and located the fallen debris. The material came in all shapes, sizes, and states: Some chunks were huge and crispy black on the outside, a result of the red-hot exterior solidifying during the material’s brief flight. The samples she collected are now at the UI. Beginning in the summer, Ukstins’ team will analyze the specimens to determine their chemical, elemental, and mineral compositions using two high-powered instruments. Photo by Shane Cronin, University of Auckland (N.Z.). Ukstins traveled to Yasur because it’s a living laboratory: The volcano has been erupting continuously since at least 1774 when it was first observed by the British explorer Captain James Cook. New research has shown it has been ejecting material without major pause for more than 1,400 years—and possibly as long as 20,000 years. “It’s about as close to a continuous record as you can get,” Ukstins says. What Ukstins aims to learn is whether the concentration of toxic gases, such as sulfur dioxide and fluorine, differ between the liquid inside the volcano and the ejected material. She also wants to study activity in the magma chamber, the frothing stew of lava just inside the volcanic cone, to learn more about how eruptions change over hours or days. “If we can understand how Yasur works, we can understand better how other volcanoes work,” she says. 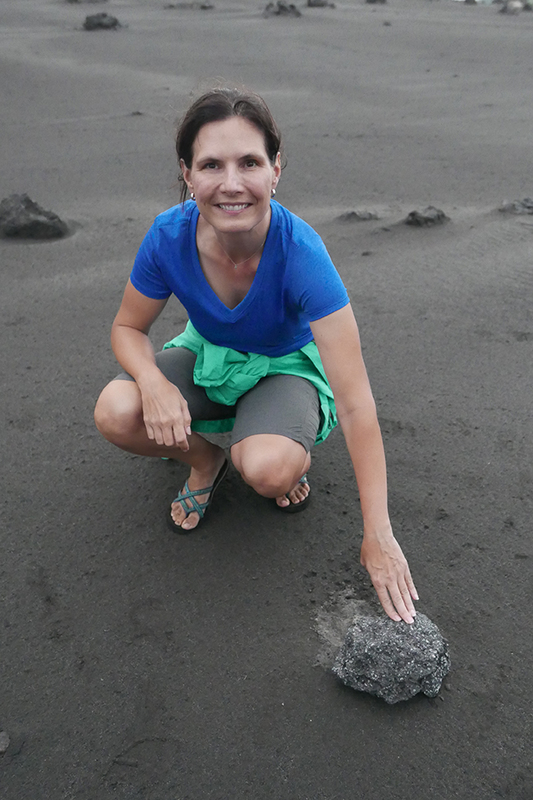 Ukstins has studied volcanoes in Chile, China, Greenland, Hawaii, and Iceland, among others. Though she can gain valuable insights from each, she was especially interested in studying an active volcano. She learned about a research team from the University of Auckland (New Zealand), led by professor and volcano expert Shane Cronin, that since 1999 has been studying the effects of Yasur’s gases on people living nearby. Ukstins obtained grant money from UI International Programs and the Department of Earth and Environmental Sciences to join the Auckland team. She arrived on Tanna in late November. “I was just very lucky to tag along, scientifically speaking,” Ukstins says. She slept in a bungalow with netting tucked around her bed. Video by Ben Simons, University of Auckland (N.Z.). In the field, Ukstins watched for eruptions and located the fallen debris. The material came in all shapes, sizes, and states: Some chunks were huge and crispy black on the outside, a result of the red-hot exterior solidifying during the material’s brief flight. Other pieces were partly liquid, like fiery water balloons that landed on the ground with a splat. Ukstins carried a hammer and chipped off samples from the larger, solid chunks, taking care not to burn her hands as she amassed her inventory. The samples she collected are now at the UI. Beginning in the summer, Ukstins’ team will analyze the specimens to determine their chemical, elemental, and mineral compositions using two high-powered instruments—an electron microprobe and an inductively coupled mass spectrometer. Ukstins was especially struck by Yasur’s effects on the villagers who live near it, many of whom display physical symptoms, from pock marks in their teeth to brittle bones. The Auckland researchers suspect the physical ailments are the result of overexposure to fluorine, which the villagers breathe in the air and ingest in plants that absorb and store the gas. Ukstins helped her Auckland colleagues obtain plant and soil samples around the volcano that will be measured for their concentration of fluorine and other potentially harmful volcanic byproducts.